When you see the mess, call ABCS! The premier carpet cleaning service! Based in Chalfont, Pennsylvania. ABCS Carpet Cleaning started in 2008 as a carpet cleaning company but quickly adapted to the growing needs of customers to incorporate tiles, stone, upholstery, hardwood floors, small water damage, and even RVs and boats! Majority of our clients have been residential home owners looking for the best possible service at a competitive price. What sets us apart from the rest is the fact that we are a small, family-owned company and are able to dedicate more time and care to each individual client. We understand that floor spots are a pain, but let us bear that burden for you. As a highly regarded floor cleaning agency in the area, we have been satisfying our customers from Chalfont to Philadelphia for years. And to ensure our success with each project, we offer free on-site estimates! While a large portion of our services have been provided for residential homeowners, commercial buildings are another area of our expertise. We perform regular cleanings at various companies across the greater Philadelphia area. Some of these industries include assisted-living facilities, law offices, and other varying locations. When we leave the job site, you can rest assured that your floors will look like the day you installed them! Still need a reason to contact us? 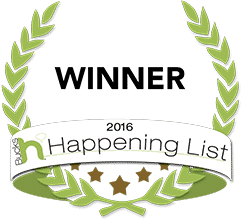 How about the fact that we were awarded the Bucks Happening List Winner for 2016 in the category of Carpet Cleaning! And rest assured, we only use state-of-the-art equipment to get every piece of dirt and mildew off your floor. At the time of our departure, you won't be able to recognize your floors!